Bus from Shah Alam to Alor Setar is the preferred transportation among locals travelling between the two cities because of its frequent departures and budget fare. The direct bus service from Shah Alam to Alor Setar saves the passengers from getting to Kuala Lumpur TBS for taking bus or getting to KL Sentral for taking ETS train. 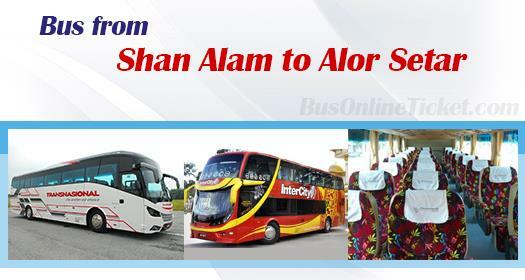 There are two types of service providers offering bus from Shah Alam to Alor Setar. Transnasional and Intercity Coach are the first type of service providers running the bus service under own counter brand. As for Hidayah Sutera, DSM Bersatu Enterprise and Masa Kini Resources, they are the reputable bus agents in Shah Alam managing other express bus under their agency brand. They are the second type of service providers. The express buses under their management include City Holidays Express, Persada Express, KPB Express, and Cepat Sedia Express. The commonality among service operators is that they provide spacious VIP bus plying Shah Alam and Alor Setar. VIP coach is equipped with seat layout of 1 seat on the left and 2 seats on the right. The spacious seat layout in VIP coach ensures passengers having comfortable journey to Alor Setar. The bus fare for bus from Shah Alam to Alor Setar is at premium pricing because of convenient boarding point in Shah Alam. Instead of travelling to Kuala Lumpur for boarding, passengers can now board the direct bus to Alor Setar from Shah Alam Bus Terminal. The bus fare is ranging from RM 40.00 to RM 53.00 depending on choice of bus operator. Duration required for bus from Shah Alam to Alor Setar takes about 6 hours. 1 stopover will be provided for washroom break during the journey. Due to high demand for bus service from Shah Alam to Alor Setar, passengers are advised to booking online in advance with BusOnlineTicket.com. With convenient online booking service and many choices of bus operators and departure times, this makes BusOnlineTicket.com to be one of the most popular online booking portal among its customers throughout these years.